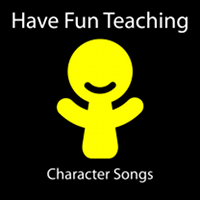 Have Fun Teaching has just released its 3rd CD called Character Songs. This album is all about Character Education. With this fun and engaging educational music, kids can learn positive character traits, good behavior, and ways to become a active citizen in their community. Have Fun Teaching's third album, Character Songs, has catchy lyrics and fun beats that your kids will love. These character education songs will teach your kids positive character traits and will help build their understanding of how to be a good person and how to treat others with respect. Not only do these songs teach kids about building their own character, there are also songs that teach kids about community and being a good citizen (Community Song) and also how to be good friends (Friend Song). Teachers, Parents, Homeschoolers and Kids will love these fun songs for kids.